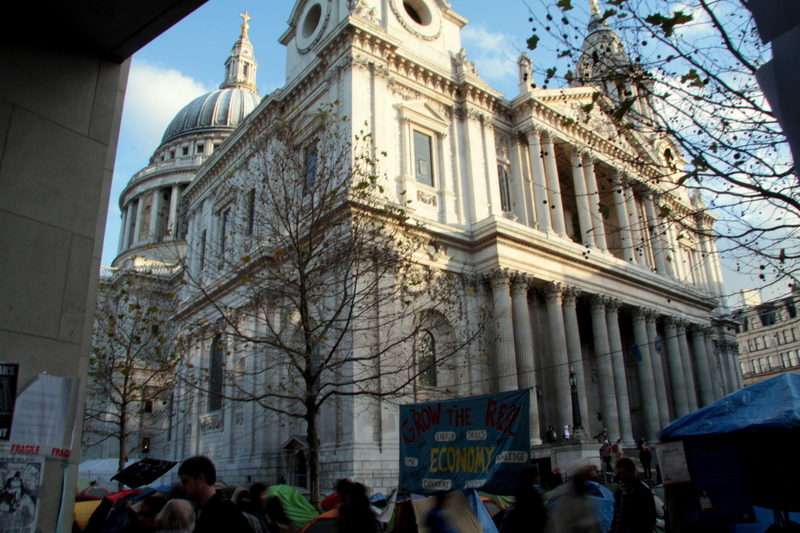 Eviction of the Occupy camp at London's St. Paul's Cathedral began Monday. If you happen to be looking for B.C. Premier Christy Clark at 8 o’clock on a Sunday morning, you might find her at Christ Church Cathedral in downtown Vancouver. A former religious studies scholar at the University of Edinburgh, Clark worships now and then at the century-old Anglican church on Burrard. She even popped up as a reader at one recent service, filling the beautifully restored Gothic interior with her smooth radio voice. Christy Clark describes herself as a devout Anglican. At the same time, she presides over the province with both the highest child poverty rate and the lowest corporate tax rates in Canada. Her first budget as premier, released last week, does nothing to diminish this inequality. Even as a lapsed Anglican, I detect a troubling contradiction. Jesus seems like the kind of long-haired revolutionary who would be down at the local Occupy camp or homeless mission, washing feet. How do you reconcile what he said about rich people with policies engineered to favour the wealthy? Coincidentally, I was baptized at Christ Church Cathedral — where both Christy Clark and the British Royal Family worship when they’re in town. I suppose I lost interest in organized religion during high school. The Anglican Church wasn’t addressing my reality, so I drifted away. Lately, though, I’ve had second thoughts. The larger conversation around inequality seems to be crystallizing, giving the Church a unique opportunity to make itself relevant. Beyond scripture, the Anglican Church has infrastructure and organizers in nearly 3,000 communities across Canada. It has meeting rooms, kitchens, heated halls, garden space and an internal communications network. In other words, the Church could be a significant ally in projects of large-scale social change. If you multiply that across other Christian denominations and faith communities, some of which already take a more active political role, the potential is enormous. Here’s an example: Christy Clark still hasn’t decided whether her government will support the Northern Gateway pipeline. What might happen if the Anglican Church took a public position on the pipeline before the premier? Is the Church too stained and enfeebled by history to hold sway? Or is it time to reinvent itself as a vital voice in the public conversation? I believe the Church’s problem is that of any organized religion. It’s much like a corporation and too driven (generally) by greed and power hunger. That is how I lost my faith, early on in highschool as well. I hope I am wrong and I am much too generalizing, and should it ever step up to what you suggest it should, I would be the first up to applaud. What’s up dear, are you enjoying with this comical YouTube video? Hmmm, that�s good, I am also watching this YouTube humorous video at the moment.